Applying to Pre-K? Some popular schools have hundreds of applicants for just a few seats, but we've compiled a list of promising programs that aren't hopelessly oversubscribed. Applications are due March 30. See our Pre-K guide to learn how to apply and to search by address for all Pre-K programs in your neighborhood. In District 7, the principal at Concourse Village Elementary School inspires students to reach high. Little Haven at Mott Haven Academy Charter has two joyful pre-k classrooms and lots of loving support. The school's chef serves up broccoli, edamame and other healthy options. Priority goes to kids in foster care. Note: Mott Haven is a charter school: Applications are on the school's website and due March 31. In District 8, PS 69 has a flourishing vegetable garden and a principal who was trained at respected early childhood think tank Bank Street College. Schools Chancellor Carmen Fariña visited Kiderific Nursery School and found it to be "exciting, invigorating and joyful." Best bets in District 9: Mount Eden Academy may have space in the district for non-siblings. On the southern end of the district, we like PS 63 Author's Academy. St. Simon Stock in District 10 has four pre-k classrooms that serves children from Pakistan, Africa, Dominican Republic, El Salvador, Puerto Rico and elsewhere. Principal Kinsley Jabouin is proud of the pre-k’s above-average ratings. Reach out to him at [email protected] with any questions. The building has an indoor gym with tricycles and other equipment, and takes part in the Building Blocks math program designed to give young children a good sense of numbers. Pre-k expert Kym Vanderbilt of Lehman College likes Amalgamated Nursery School and Marble Hill Nursery School. Another option with solid ratings is the pre-k classroom at PS 51 Bronx New School. Public school pre-k programs in District 11 tend to fill up with siblings. However, three pre-k centers are spread across the district—on Lydig Avenue, White Plains Road and Matilda Avenue. Put them on your visit list. 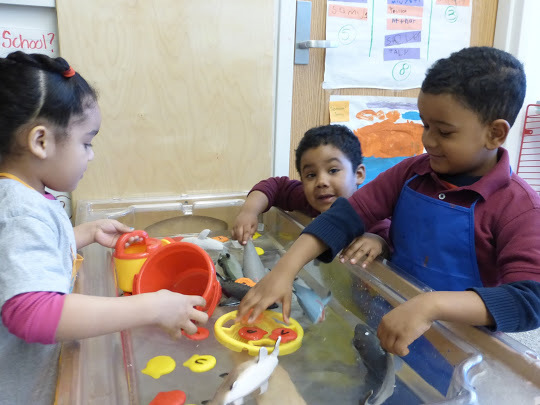 In District 12, Little Scholars Early Development Center, a Reggio Emilia–based program with another location in District 10, is "truly wonderful," says early childhood expert Kym Vanderbilt. In the Reggio approach, children explore art, drama, music and more. Preference goes to low-income families. Every school in District 1 (except some charters) offers pre-kindergarten. The DOE suggests listing at least five pre-k programs in the district. There are no zoned schools, so once you are accepted into pre-k, you are guaranteed admission to kindergarten at the same school. Consider PS 15 Roberto Clemente, which has smart leaders and happy teachers. We also love Neighborhood School, which mixes pre-kindergarten and kindergarten in one room so 4- and 5-year-olds can learn from one another. Slots may open last-minute, according to office staff. The Children's Workshop School prides itself on an ethnically diverse staff and student body, and has two pre-k classrooms. The STAR Academy—PS 63 has a hands-on math program we love, in which kids explore numbers, patterns and shapes, and big words like "hexagon" and "pentagon." The parent coordinator says the school takes about 25 percent of their pre-kindergartners from outside the district. Bank Street Head Start continues the lively exploration-based approach developed at the renowned Bank Street school for Children. It gives preference to low-income families and has had room in recent years for some families from higher income levels. District 2 has some of the best schools in the city, and it's hard to go wrong here with pre-k. PS 126 is a small, progressive school with strong sports and arts programs. PS 33 accepted some in-district, non-sibling kids last year. PS 340 Sixth Avenue Elementary School accepted only a few children outside of its zone, but it’s worth taking a look at the pre-k center in the same building. Parents rave about pre-k centers at Peck Slip and on Chambers Street. Four pre-k classrooms opened at PS 6 in 2017. Most District 3 schools have far more applicants than seats. In Harlem, we were impressed by PS 185's engineering program that includes a LEGO Lab. PS 180 had space for children from across the district. On the southern end of the district, at 210 W. 61st Street, PS 452 has three classrooms. PS 191 has always had a popular pre-k program and now it boasts a modern new building also located on W. 61st Street. Our picks in District 4 are sweet, safe PS 112, led by longtime principal Eileen Reiter, and tiny, progressive River East, open to children district-wide. They are in the same building. There was some room for in-district, non-sibling kids at respected PS 171. There's positive buzz circling around PS 125 in District 5, which offers swimming, yoga, blocks and LEGOs, and has a multiracial parent community working together. A fixture in the Harlem community, Addie Mae Collins 3 (which gives priority to low-income families) takes kids on trips to the New York Aquarium, the American Museum of Natural History and other cultural institutions. Some of the most sought-after schools in District 6 have far more applicants than seats. PS 173 has a popular new principal, and the school took kids from out of the borough last year. Early childhood expert Kym Vanderbilt says Fort George Head Start, which prioritizes low-income families, is "very good." She also recommends the Children's Aid Society pre-k programs at PS 5 (full day) and PS 8 (half day). A new pre-k class opened at PS/IS 187 in Washington Heights and promptly filled with mostly, but not all, siblings. Progressive Castle Bridge gives priority to students from low-income families for half of its seats. Applications for pre-kindergarten for children born in 2014 are due March 30, 2018. Families may apply to up to 12 programs online, over the phone at 718-935-2067, or in person at a Family Welcome Center. See our How to Enroll page. For more information see our What to look for and Your options.